This is the first game in the Quake series. For other games in the series see the Quake category. 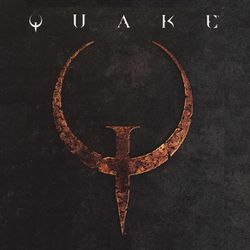 Quake is a first-person shooter computer game developed by id Software and released on June 22, 1996. In Quake, you take on the role of a soldier who is the last surviving member of a taskforce assembled to stop codename Quake, a mysterious enemy who is using slipgate technology to attack military installations. When Quake pre-emptively takes out the rest of your task force, you must use a slipgate to teleport to his own dimension to extract some payback. This page was last edited on 8 July 2016, at 20:11. This page has been accessed 15,458 times.